I might be more excited about my daughters’ Christmas gift than they are. That is definitely true for now, of course, since they don’t know what it is yet. It falls into the category of “potentially life-changing things that you don’t even really know about.” So they can’t be very excited about it, not even knowing the potential it has for them both. This is the year of the 18” doll. We decided not to go for the American Girl doll, not yet. One daughter is still too likely to draw all over things that are not, strictly speaking, art materials, and one has a penchant for cutting hair. I did some preliminary browsing on eBay for Felicity and considered briefly whether it was the year to hand down my own beloved Samantha. I decided it was not. Instead, we are expecting the arrival (any day now! any day!) of Margaret and June, two lovely girls who are not American Girl dolls but are 18” tall and will be in for all kinds of excitement at our house. Lucy and Nora have NO IDEA. Margaret and June also have no idea…but I have every reason to hope they are solid, loyal, adventure-loving types who won’t be intimidated by space travel, medieval jousts, fort building, impromptu gymnastics meets in the backyard and long car rides. You know, the kind of girls that would be protagonists in an E. Nesbit novel, or maybe Jessie from the Boxcar Children. My own American Girl doll story started way back when the company was still Pleasant Company. They sent out a small catalog (there was no internet then). There were only three dolls- Kirsten, Samantha, and Molly- with maybe three outfits each, and I was (by most accounts) too old to play with them. I saved up all my money from doing odd jobs and babysitting my younger cousins to buy my very own Samantha. It was $74 for the doll and the paperback book, and it seemed like more money than I could imagine. It took me over a year. When I finally had the cash in hand, my mother bought the doll and even sprung for the extra money to upgrade to a hardback book. That was lovely of her, wasn’t it? Of course, now, there are no shortage of things that are the right size for Molly and them, since everyone in the world has an 18” doll from someplace. Pinterest is full of all the amazing things that properly motivated, crafty moms and other concerned adults can create for the dolls in their lives. The rational thing to do, especially the week before Christmas, is to say, “Oh, aren’t those cute?” but to privately thank your lucky stars that you have better things to do with your life than to build bunk beds for dolls out of end tables or create ballet barres for them out of pvc pipe (spray painted pink, of course). This week, since we decided that Margaret and June will be joining our family, I have been falling down the rabbit hole of 18” doll paraphernalia DIY sites and currently have a list of projects to last a lifetime. 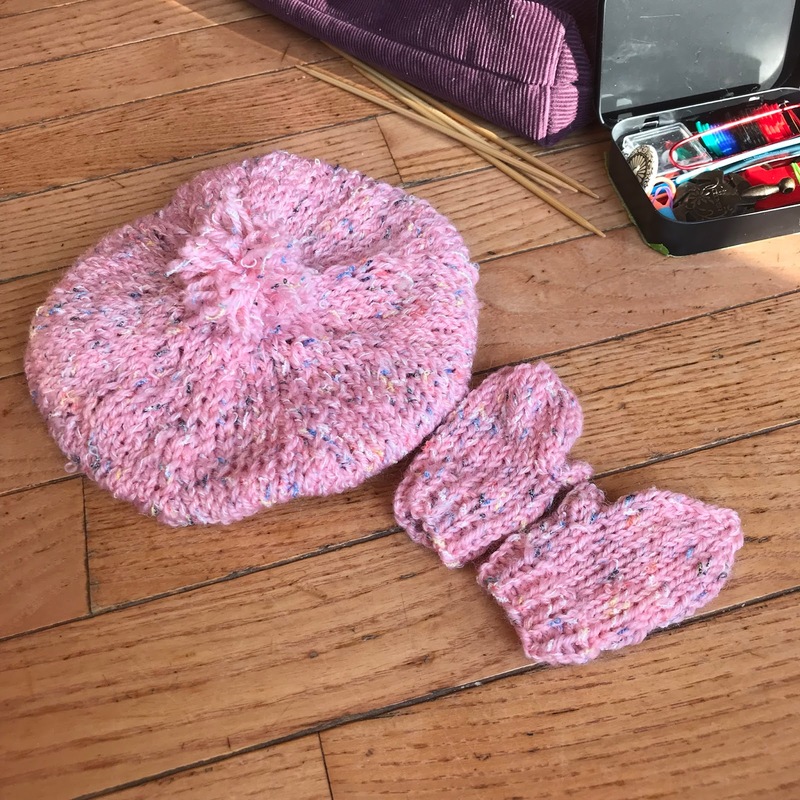 I may have stayed up too late last night knitting a pink beret and matching mittens for June, prompting my husband to utter the words that titled this post in which I lay all the evidence out for you and wait for you to assure me that this is totally normal. I’m trying to convince myself my excitement for my girls (I mean my daughters, of course, not Margaret and June!) is just that, excitement for my girls, and that it doesn’t mean I’m projecting my childhood onto my daughters with expectations that they will have the same love for their dolls that I did for mine. My Gram, who spent her retirement winters against her will in Florida away from her beloved grandchildren, once sewed complete wardrobes for Molly, Samantha and Kirsten while she was away, just because she loved to do such things. My mom tells stories about receiving dolls for Christmas with beautiful hand-sewn wardrobes of clothing, including wedding dresses and lined wool capes with matching skirts and blouses, all because Gram enjoyed making them so much. I’m telling myself that a love for creating tiny clothes is just something I inherited from her and that I’m not actually obsessed. It’s hard, though, because I want Margaret and June to feel welcome and to be appropriately attired for the weather, and they ought to have pajamas and bedding that matches the girls’, don’t you think? Maybe that’s going too far.